In a normal year, we would be running the sprinklers on the garden about now, because it would be so hot and dry, with no promise of rain. But this is not a normal year. I'm not sure what that even is anymore. We've just come out of one of the wettest Junes on record and July is off to a soggy start. Last night, we had over four inches of rain and we really didn't need any. 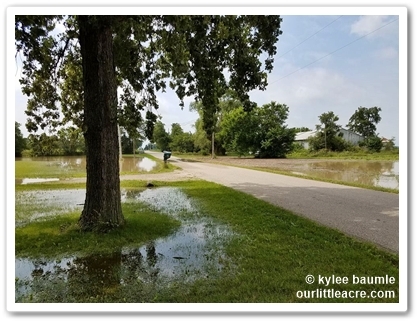 There was water laying in the field across the road and our next-door neighbor had lakefront property right out his front door. We've got two sump pumps in our basement and both of them running together could barely keep up with the water coming in. Fortunately, we weren't one of several residents in the area that lost that battle. All this rain means the gardens are looking fantastic. The hostas appear to be on steroids. The double daylilies are blooming 100% double, for once. And the weeds are growing so fast and so big that I don't recognize them. About those weeds... 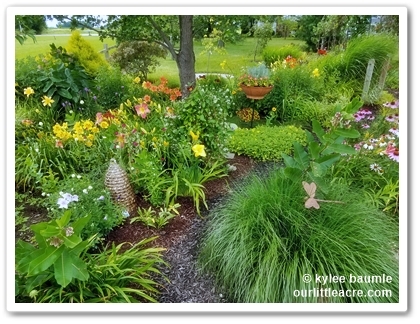 The gardens proper are doing fine in that department, thanks to either full plantings or mulch that's doing its job. But two areas are in desperate need of help. The Berry Barn, which I had completely weeded four weeks ago - it looked fantastic, I promise - now looks as if I haven't set foot in it all year. And the grape arbor, well, let's talk about the grape arbor. We first planted grapes in 2008 - Mars, Reliance, and Himrod. We enjoyed these seedless table varieties for many years, until the last couple, when they just didn't do well. This spring, ironically, none of the Reliance vines made it through the winter. One Himrod bit the dust and the other one isn't looking that good either. Both of the Mars vines made it, but they aren't producing a single grape. This has caused us to reevaluate this grape thing. Romie wanted to just tear out the arbor and be done with it, but I wouldn't have any of that. I love that arbor, grapes or no grapes. So we I decided we'd let the grapes that remain do their thing and plant various clematis vines in place of the grapes that died. "What if the clematis starts climbing all over the grapes?" he said. "Then they'll look pretty," I said. And that was that. 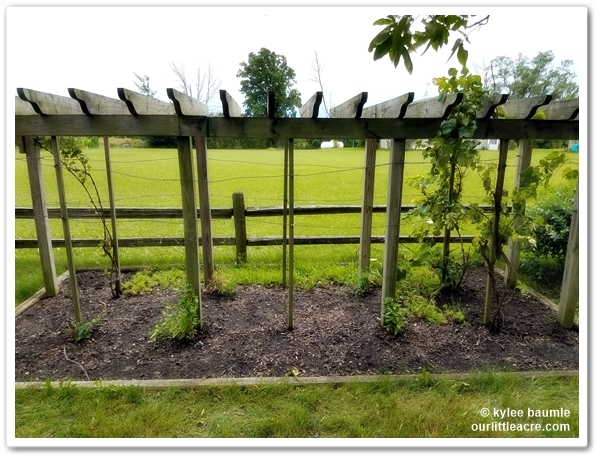 But this post is about weeding, and the base of the grape arbor was absolutely solid weeds. looked like that when I started weeding. Dandelions, various grasses, a couple of types of clover (and they'd produced seed pods by now), poison ivy, plantain, baptisia seedlings, white mulberry, thistles, Washington hawthorn seedlings, creeping euphorbia, and various other weeds had made themselves right at home while we mulled over what to do. Since the arbor was staying and we were growing desirable things on it, these weeds had to go, but oh my gosh, where to start? Images of a bulldozer came to mind, but we didn't have one. I love my family of Cobrahead weeders, but this was no match even for those. But sometimes, ever so rarely, I have moments of brilliance. They're so few and far between that I'm prouder of them than I have a right to be, mainly because I know that every other person on the planet already knew about this long before I did. But dang, if I wasn't excited about the idea that popped into my head one day when I was doing absolutely nothing and having a good time of it. 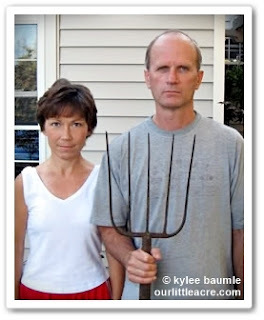 What if... just what if I took my grandpa's manure fork (it looks like a pitchfork) and skimmed across the top of the weed-infested soil, about 2-3 inches deep, loosening the soil so that I could sift out the weeds? This would be better than hoeing because if you cut some of those weeds, that just means if you don't remove all the pieces, you're screwed. Some weeds are like earthworms - cut them up and they make new ones from the pieces. I tried my method on a defunct strawberry bed first. It was a small area and I wanted to use the plot for something else. Oh. My. Goodness. Why I had not thought of this earlier, I don't know, but I now don't look at the weediest of beds with disdain anymore. It's actually kind of fun, because it's a much quicker and easier way of removing large quantities of weeds. What about the dandelions though? No fork is going to remove those that easily. 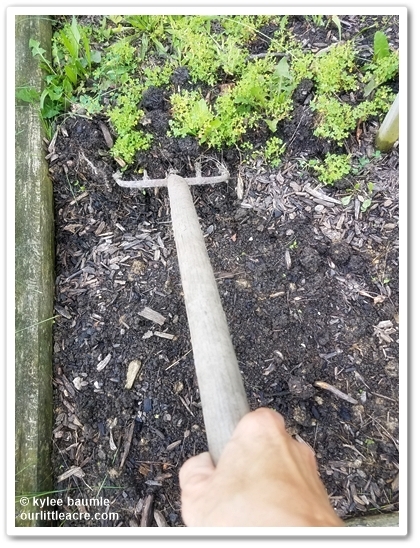 No, I still had to pull those out individually (unless they were small), but by loosening the soil around them, it made it that much easier to pull them out and get all the roots, especially with soggy soil. Until the rains came last night, I made quick work of the grape arbor area. I'll finish up when we dry up a little bit. 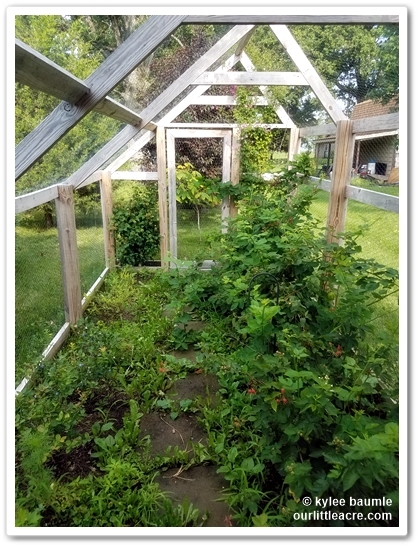 It won't take me long to finish the grape arbor and then I'll move to the other side of the yard and take care of the mess in the Berry Barn.